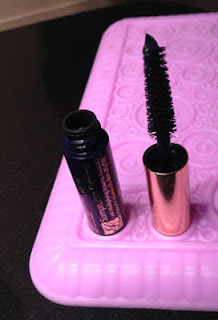 THE SKINNY: If you want dramatic lashes, Estee Lauder Sumptuous Sculpting Mascara is for you. This mascara lengthens, thickens and adds lots of drama to everyday lashes. This is not for the subtle lash type of girl. The texture was nice, a little on the thing side, and smooth. It did though start to get a little goopy after being open a couple of weeks. The only downside? The mascara did not separate as much as I would like. Lashes seemed to stick together some -- not in a yucky way but I am more of a fan of lots of tiny lashes. It was though very nice for a night out because of the high-drama look. Once again, Glossybox -- LOVE IT -- delivered with a new and fairly premium product. KEEP OR TOSS: Keep. It's a decent mascara, just not my favorite. CHECK IT OUT: Estee Lauder Sumptuous mascara comes in black and brown and can be found online, from premier retailers and Glossybox.